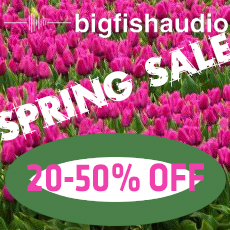 Almost all Big Fish Audio titles at springtime prices, until April 25th! 20 to 50% discount, the displayed prices are already reduced ! Bass Pop: Bass-Pop-EDM Construction Kits is here, proudly containing 50 kits to inspire your next Pop or EDM production. Produced in the styles of popular artists like Meghan Trainor, Fifth Harmony, Ariana Grande, MAGIC! and more, Bass Pop has tons of baselines, synth leads, drum beats, vocal chops, keyboard sounds and FX to choose from. If you’re looking for fun, upbeat modern pop elements with a retro touch, Bass Pop is your new go to! Bass Pop: Bass-Pop-EDM Construction Kits has been formatted in the most widely-used formats: Apple Loops, Acidized WAV, and REX files, making it usable in virtually every piece of software and hardware on the market today. Also included are MIDI files for most of the melodic elements so you have full control over the sound of these kits. In addition, this library comes fully formatted for Kontakt as part of the Big Fish Audio KLI 3.0 Series which transforms this loop library into a truly moldable and musical writing instrument.